Contains All – Each item in the list should satisfy the condition for Rule to evaluate as True. Contains Any – At least one item in the list should satisfy the condition for Rule to evaluate as True. Does Not Contain Any – None of the items on the list should satisfy the condition for Rule to evaluate as True. 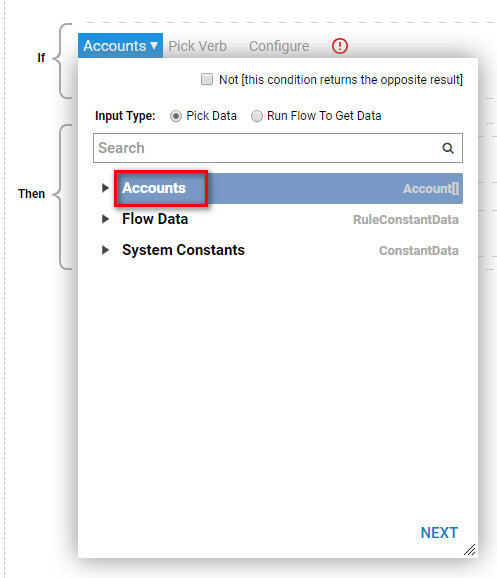 In this example, create a Rule that takes in an array of Accounts . 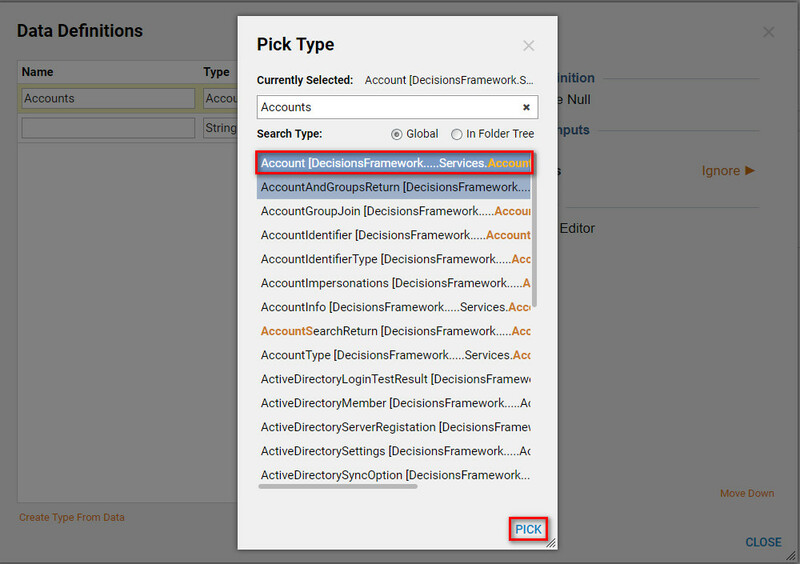 It should evaluate as True	if all Accounts in the array have Email Address	that contains “decisions”. 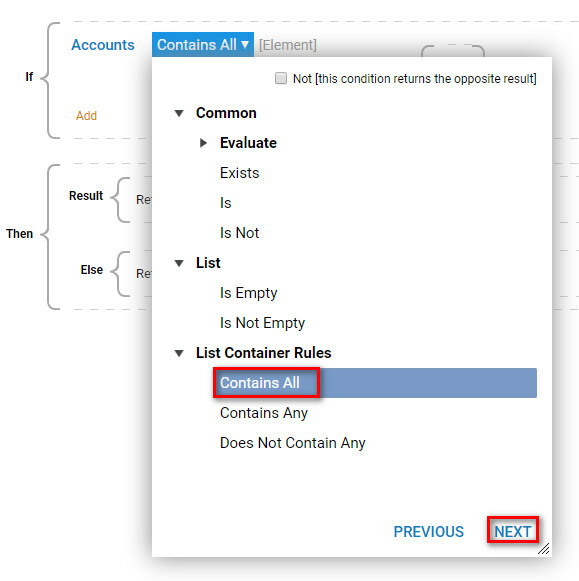 This example requires List Container Rules	to test each Account in the array. 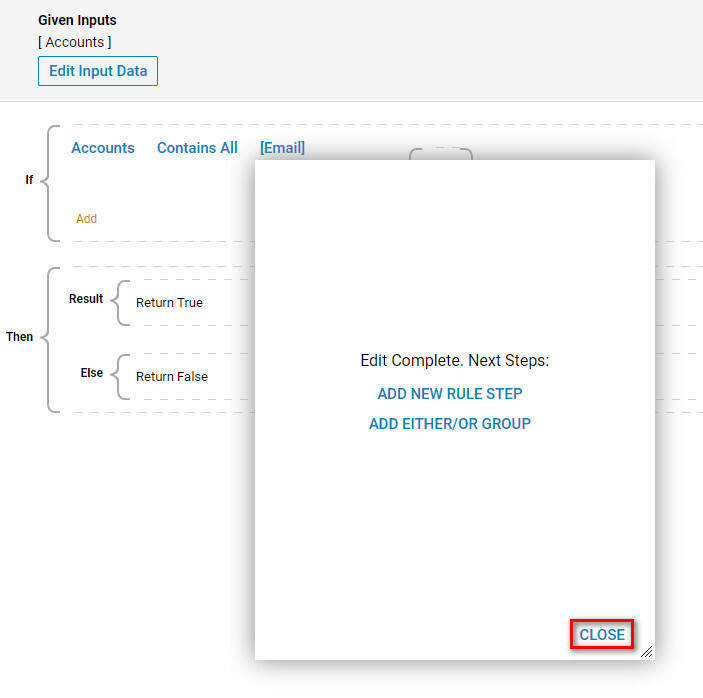 Begin in the designer Folder by selecting the Create Rule	option in the Folder Actions Panel. In the resulting window, Name	the Rule (List Container Rule) and select Create	to proceed to the Rule Designer. In the Rule Designer , we click Show Editor	link to add Rule Input Data. Set up the Data by creating a name called Accounts	. Next, select the Type by choosing All/Types	and search for Accounts. 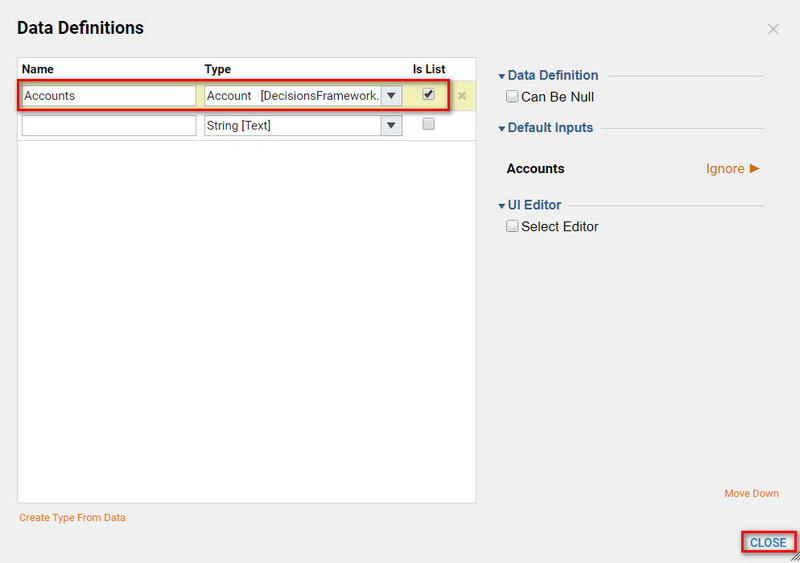 Next, after the Data Definition has a Name,	select the Account	Type. Check the Is List	check box, this will make the definition an array that displays Contains All, Contains Any or Does not Contain Any	. Then, we select close to save and begin setting up the Rule. 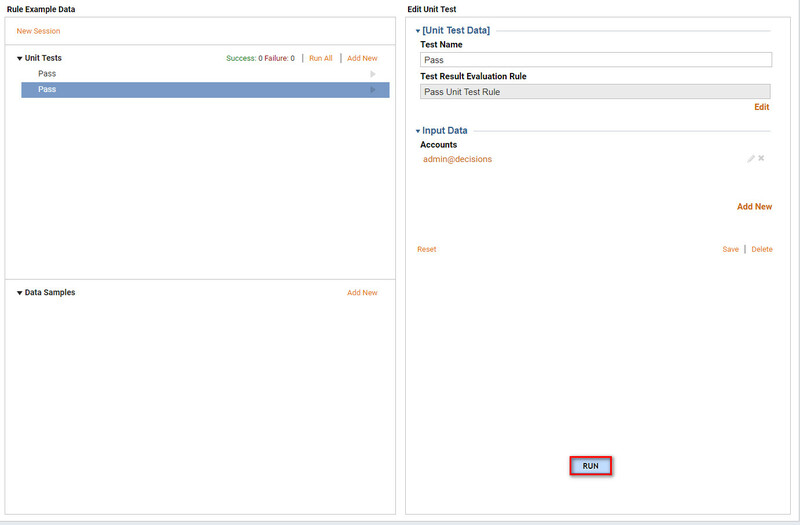 In the Rule designer, the Rule Input Data will not show Accounts	in the show editor text box. 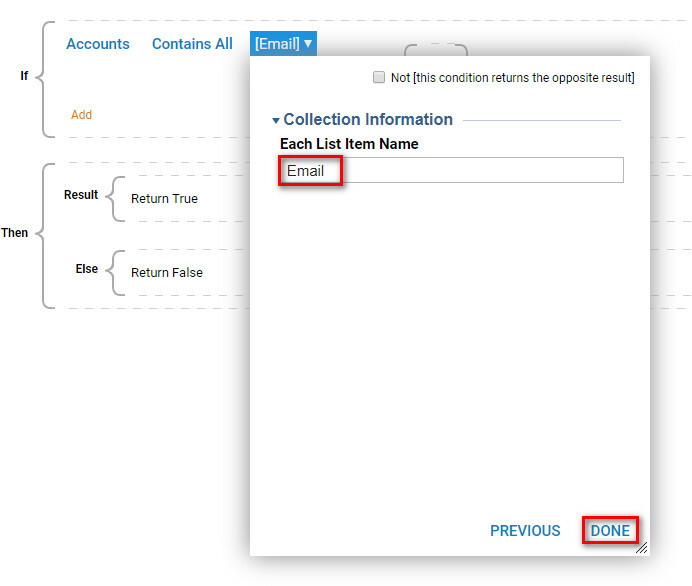 Begin by choosing Accounts in the Select Data Element	(drop-down). In the next window we should be able to see List Container Rules	category because Accounts variable is an array. 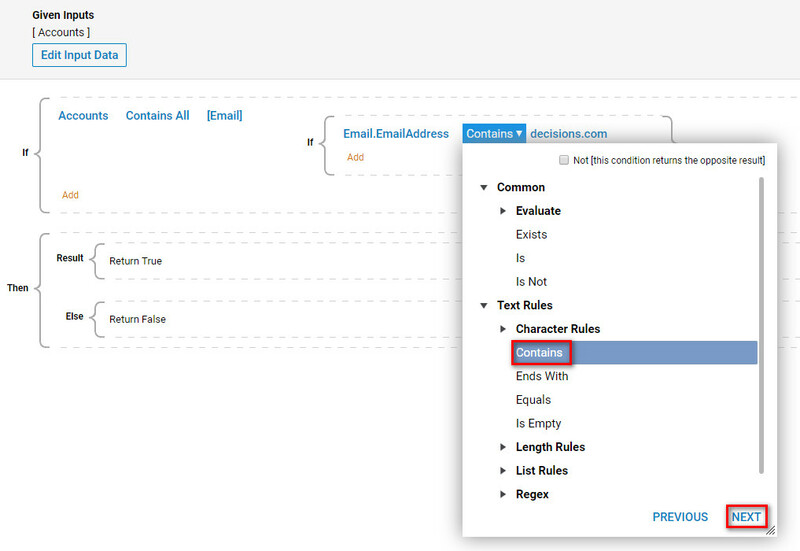 We click Contains All	option from the List Container Rules	category because we want to check if all Emails contain “decisions” . Then, we click Next	. Choose Pick Verb,	Contains All. In the next window, we should be able to see List Container Rules	category because Accounts variable is an array. 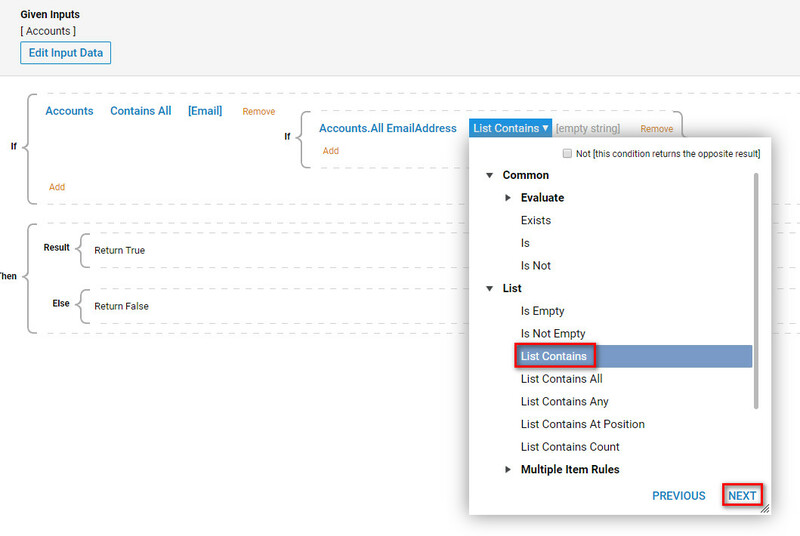 We click Contains All	option from the List Container Rules	category because we want to check if all Emails contain “decisions” . Then, we click Next	. Under Collection Information and Each List Item Name	give the input a name to provide a Name	for the Element	in the array and select done. In this example the name provided is Email. The List Container Rule is now complete. Selectclose	to save the Rule. 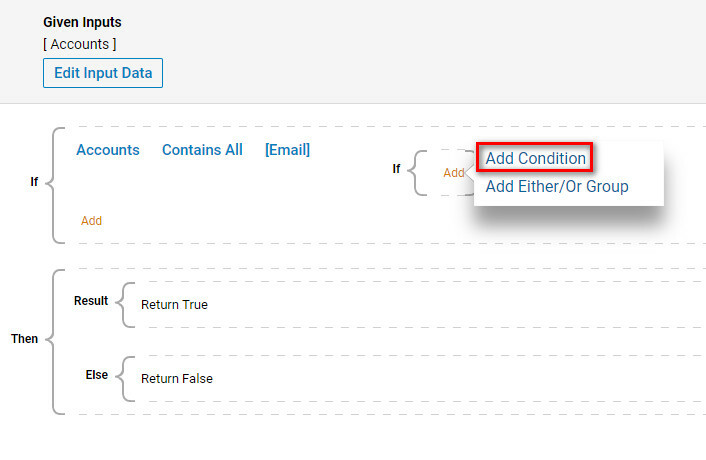 To create conditions to check each item, select Add	and then choose Add Condition. Each item passed through the Rule will need to pass the condition created. 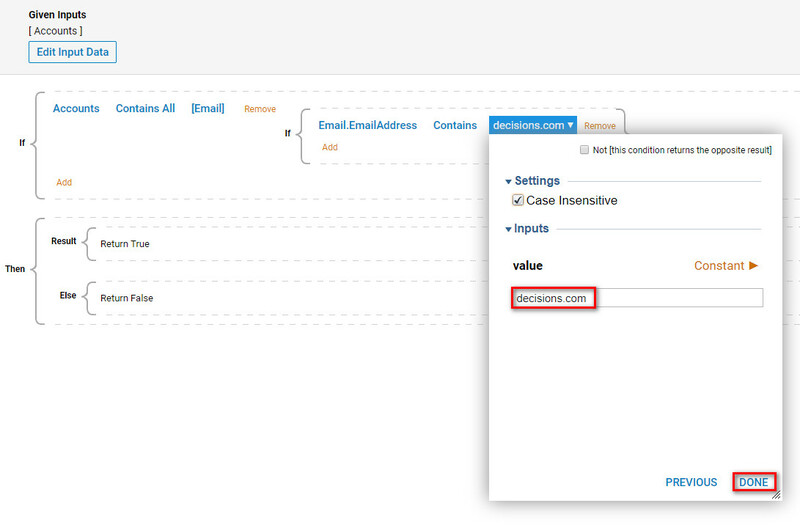 This condition will check to see if Account.EmailAddress	contains "Decisions". 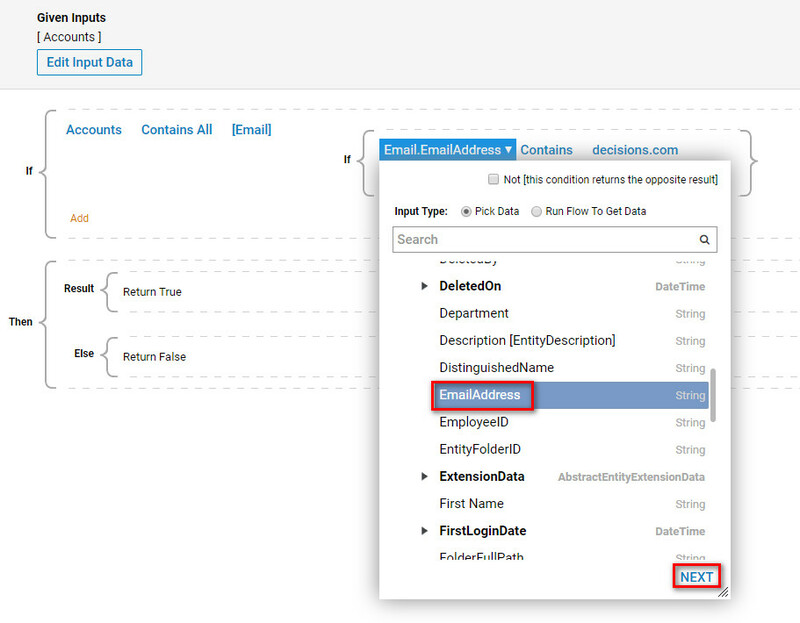 Expand the Email	category (which is the Name for each element in the Array) and select the EmailAddress	string, then, select Next	. In the following window, select Contains verb	from the Text Rules	category and choose Contains	then selectNext	to continue. In the last window of the Rule Phrase Builder , set Mapping Type	Constant with Value	“decisions”. Select Done	to save the Rule. Next, Create two Unit Tests	for the Rule . Start by naming the first Unit Test Pass	, leave Test Result	to Pass and select Add New	to add accounts to the Rule Input. This Unit Test only accounts that contain “decisions” in their Email Address. Select Save	to save this Unit Test. In the same way, Create a second Unit Test called Fail and choose and email address that does not have "decisions.com" in the address and check the results.